My Romantic Home: Delivery on my door step! Delivery on my door step! I love coming home to find a package on my doorstep. Today I had two! I knew my sheets were coming from Overstock because I've been tracking their progress online since last week, weather delays and all. But when I arrived home I found two packages. 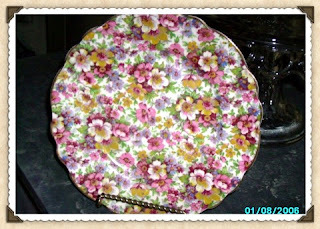 The other was a chintz plate that I ordered on Ebay. After I did my post on my chintz collection, I started thinking that maybe I should check Ebay for some good deals on chintz. I think I found a great deal here. This plate was less than $20 with shipping and it's not new it is vintage. I saw it for sale on another website for over $200. Okay, I know, I don't believe that everything I see on the internet reflects what an item is really worth but I know it must be worth more than $20. It is to me and that's all that matters. 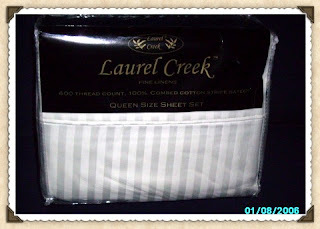 The 2 sets of 600 thread count sheets were a belated Christmas present from my mom. I've already washed a set and have them on my bed. My mom has these sheets and she loves them. I can hardly wait to go to bed tonight. When I was on my way upstairs tonight (carrying a glass of red wine) to get on the computer to post this I tripped on the leg of my pants and fell. The red wine went up onto the wall and onto the carpet. I fell so hard that I have a rug burn on my knee. So here's my question to those of you over 40...do you feel like you are more clumsy now? I never used to fall and the last few years I fallen a few times. Sometimes it's not my fault, you know, flip flops on a wet floor sort of thing. I think maybe when I was younger I could catch myself better before I actually would fall, maybe my reflexes are just slower. I think next time I go to the doctor I'll ask him about this although it's sort of embarrassing. oooh, lovely sheets!! So pretty!And I am so sorry that you fell! A year ago I fell in front of a store, flat on my stomach, purse went flying, etc. I skinned my knee really bad. I feel more clumsy now too ~ Oh the joys of getting older! Please feel better soon! Cindy, I am Ashley's mother, and although I am quite a lot older than you, I have fallen three times during my 40's and early 50's and just like you said...it caught me by surprise; quite off-guard. I'm not sure what it is, but yes, I do think things like this happen more frequently as we become older and wiser...just not more careful! :=) Take care. I'm enjoying your blog, too!